Toulmin assured Wilbur Wright that he would be able to secure a broad patent that would provide great protection for their invention. On January 22, 1904, Wilbur Wright hired Toulmin to help them with their patent. Toulmin suggested that instead of attempting to patent the entire plane the patent should protect the method of flight control. The flight control method included wing-warping and the three-axis system which controlled the aircraft in forward flight. 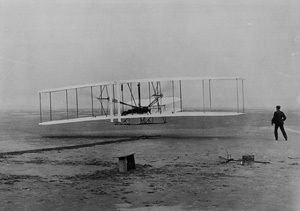 Wilbur and Orville Wright were granted US Patent 821,393 on May 22, 1906 for a flying machine. The main claims in the patent were for maintaining and restoring lateral balance of the apparatus. These claims were the basis of all successful aircraft designs. A plane could not fly without a system of control. 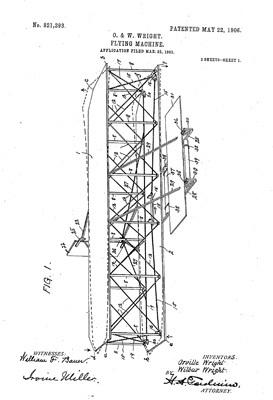 Basically, this patent meant that no one could build an aircraft without the paying a royalty to the Wright Brothers. The brothers were not opposed to taking legal action against anyone who they believed was infringing on their patents. The very broad protection of the patent helped them win over 30 lawsuits claiming patent infringement. One of these lawsuits was against Glen Curtiss. Glen Curtiss would not pay fees to the Wright Brothers for an aircraft that he sold to the Aeronautic Society of New York in 1909. He had been warned not to make a profit on any aircraft that used information from their patent. He did so anyways and the brothers sued Curtiss. The brothers won the case against Curtiss in 1913 but the decision was appealed. In January of 1914, the decision was upheld in favor of the Wrights. The Wright’s patent wars were not without consequences. Unfortunately, all of the time spent fighting to protect their patent was time the Wright’s were not spending on innovation and the development of new planes. Their planes became inferior to the planes being produced in Europe. The constant lawsuits had a negative impact on the public’s opinion of the brothers and their company. The stress, also, took a toll on Wilbur’s health. On May 30, 1912, Wilbur passed away from typhoid fever. Because all of the major patents for aircrafts were held by the Wright Company or Curtiss Company, innovation and the building of new aircrafts had been blocked in the United States. In 1917, the US Government forced the aircraft industry to form an organization for licensing patents. All manufactures were forced to join and pay a fee for each plane manufactured. A majority of the fees went to the Wright Company or Curtiss Company until their patents expired. ← Invention Geek – Smith Brothers?